If there were ever a time to radically change your investing strategy, this is it. The reality of a record U.S. deficit, coupled with an ominous inversion of the yield curve, has set a ripple effect in place that will rattle the markets and bring history’s longest bull market to a screeching halt. 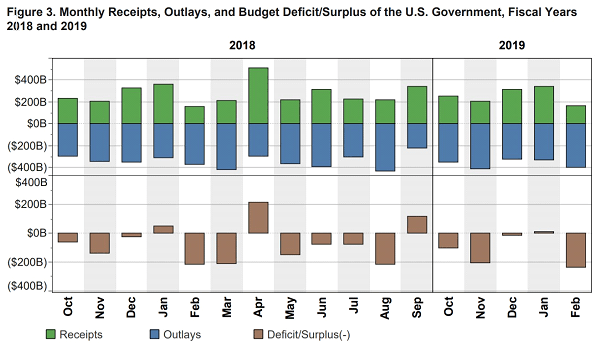 According to the U.S. Treasury’s own calculations, government spending increased by 8% in February alone, bringing the Federal Government’s budget deficit to a record $234 billion, the largest monthly shortfall on record. It’s unbelievable but true: somehow, the Federal Government managed to spend $401 billion in February while taking in just $167 billion. The previous monthly deficit record of $231.7 billion was way back in February of 2012. In 2018, the deficit was “only” $215 billion. Now, with February’s massive addition, the budget deficit has seen a 39% increase for the fiscal year compared to the same period a year ago. When this spread goes negative, you can count on a recession happening within 18 months, as this has happened consistently: the stock market crashes of 1990, 2000, and 2008 were all preceded by a yield curve inversion. If you’re heavily investing in blue-chip stock market indices, you’re exposed to massive risk and buying assets at a high price, which is definitely not a formula for building wealth. The best place to position yourself in times like this, with debts and deficits mounting and the yield curve flashing a recession signal, is the gold and mining sector. This is a sector that relies not on debt-fueled promises, but on gold, which has been a store of value and a tangible form of money for over 6,000 years. 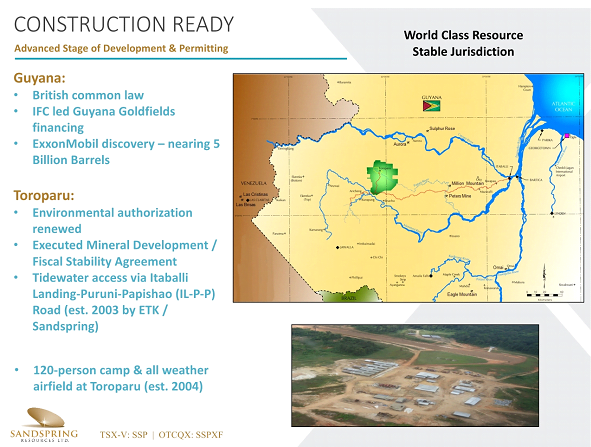 The investment I’ve been recommending as a safe haven for the coming economic storm is Sandspring Resources Ltd. (TSX.V: SSP, OTC: SSPXF), which has a 100%-owned 10-million-ounce-and-growing gold asset known as Toroparu, located in the mineral-rich and mining-friendly Guiana Shield region. Sandspring also has full ownership of the Chicharrón gold project within the Segovia Mining District of Colombia. With recent high-grade gold production and strong exploration potential from their shallow drill program, Chicharrón provides the fastest path to production and near-term operating cash flow. Indeed, the production of Chicharrón is happening on schedule, with Sandspring announcing the delineation of three new mineralized vein structures in this asset. Excellent core recovery was obtained from the first phase of drilling at Chicharrón, and a third new mineralized structure has already been identified in several drill holes in the southwestern fault block. We view SSP/SSPXF shares as a terrific value in a market where it’s tough to find value. With so much economic turmoil ahead of us, it’s time to start accumulating gold assets like Sandspring Resources for de-risked portfolio protection and superior returns even in the stormiest of market conditions.